The most common examples of technical writing are: User manuals; software installation guides; Standard Operating Procedures (SOP); Service Level Agreements (SLA); Request for Proposal (RFP); legal disclaimers; company documents; annual reports; and Help files. User manuals are documentation that accompanies various consumer electronics such as televisions, cellular phones, or gaming consoles. The technical writer must write a manual that a novice (the target audience) will easily understand. 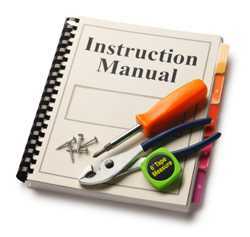 User manuals usually contain: Photographs; disclaimers; numbered diagrams; sequenced directions; flow charts; a trouble shooting guide; the warranty; and contact information for the Help Desk or Customer Support. Ideally, the engineers and programmers familiarize the writer with the product during a site visit in the planning phase. More often, the writer self-teaches operation of the device. Through the self-teaching process, the writer anticipates problems that a typical user would face. The writer learns how to address those problems and contacts the experts for explanations, if necessary. The writer incorporates only the most common problems and solutions in the troubleshooting guide. Unusual or improbable situations are best left to the Help Desk or Customer Support staff. The user manual must be very easy to follow, because technical support by phone is extremely expensive, and the customer may return the product if it is too difficult to understand. Computer software must be equipped with documentation to guide the user through the installation process. Often, the programmers automate the process and the writer just authors alert boxes and the Read Me file. Most organizations have well-defined processes for accomplishing routine tasks. An SOP can document how to process payroll, hire a new employee, or calculate vacation time. SOPs ensure that multiple people in the organization can perform the same tasks in an identical manner, so quality is consistent. SOPs help eliminate favoritism and irregularities. SOPs ensure that co-workers can assume the responsibilities of an absent, vacationing, or terminated employee with no variation in performance and minimal time lag. An SLA is a binding contract between a provider and a customer. It outlines services, guarantees, warranties, and other negotiated items between the two parties. An RFP is similar to an SLA, in that they both describe future work or services to be accomplished. An RFP differs from an SLA in that the former is used as a pitch to a potential customer during a bidding period. Therefore, the RFP is not a binding, concrete agreement. Most legal documents are extremely detailed. Although the U.S. government requires plain language in its documents, other legal documents may contain terms confusing to the layperson. The publisher may ask the writer to simplify and rephrase the "legalese" of the disclaimer elsewhere in the document. Companies must provide annual reports to inform their shareholders about the prior year's stock performance and other financial information. Some non-profit organizations also prepare annual reports. The technical writer spends a great deal of time compiling information and then presenting it in an attractive and comprehensive manner to shareholders. Help files are necessary for any type of software. The purpose of Help files is to make the user independent. Remember that Help Desk or Customer Support Staff are very expensive and reduce company profits. Write the Help file for a novice user with no prior knowledge of the system. Aim at the Grade 8 level and define technical terms in a glossary. (If this seems like "dumbing down", recall that John F. Kennedy's most memorable speeches were written for a Grade 8 audience.) Break all procedures into sequential steps. A procedure should have no more than 10 steps. Take screen shots. Link related information.